Leave a Comment on Great Partnerships: McFarland and Todd, the best defensive duo of modern times? DERBY COUNTY’s golden age was between 1971-75, during which time, they won two Football League championships during an incredible time for a club very few people would call “fashionable”. The teams that Brian Clough and Peter Taylor built created a legacy that no Derby side has been able to live up to. Derby had some excellent players in every department of their two title-winning team: Kevin Hector, John O’Hare, Alan Durban, Archie Gemmill, Alan Hinton and David Nish are all legends from the Baseball Ground era. But absolute key to Derby’s success was the central defensive partnership of Roy McFarland and Colin Todd. There have been few pairings to match them. Roy McFarland was signed by Clough and Taylor in 1967 from Tranmere Rovers. McFarland, a scouser, had set his heart on playing for Liverpool, but the persistent Clough merely said: “Young man, you are signing for Derby County,” as he tabled a £24,000 fee. “And within 12 months, you will be playing for England.” Clough got himself a bargain and although 12 months was a bit of a push for a 19 year-old, he almost got it right, for McFarland was capped for the first time in 1971 and was seen as the natural successor to the likes of Jack Charlton and Brian Labone. McFarland was imperious in the air, but he was also a great leader on the field. Clough called him “a Rolls-Royce of a defender”. Playing alongside Colin Todd, McFarland was arguably the best centre-half in the country in the early-1970s. Brian Clough knew all about Todd. He had, after all, played for the Sunderland youth team when Clough was in charge. When Clough paid £ 175,000 to take the Chester-Le-Street born Todd from Sunderland to Derby, it was a record fee for a defender. 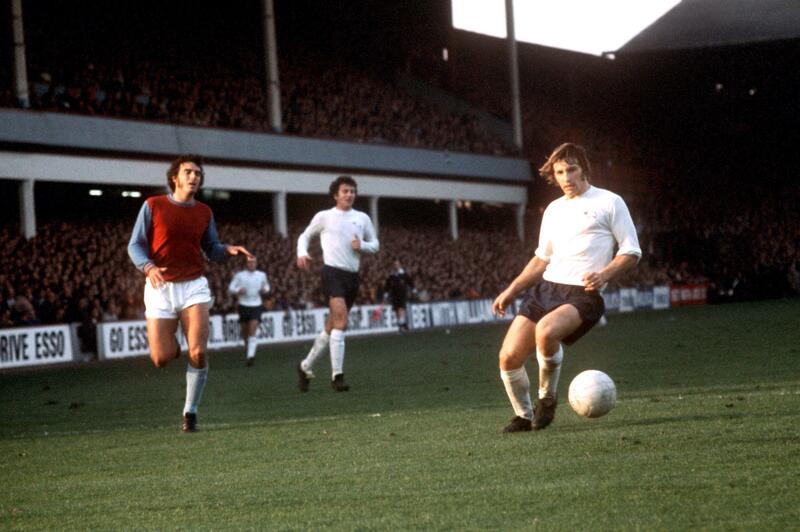 In an age when central defenders were rarely known for their speed – Bobby Moore, for example, was the master of timing, while the classic number fives were all about power and commitment – Todd was a “thinking man’s defender” and very fleet-footed. This was no mean feat in an era when the Baseball Ground was renowned for its cloying mud. He would be just as impressive today as he was in his heyday of the early-to-mid 1970s. Not for nothing did Brian Clough call him, “the best all-round footballer in Britain” when he signed him for Derby. McFarland and Todd should have won more caps for England. Between them, they appeared 55 times, with McFarland receiving one more than Todd. McFarland, whose peers included Larry Lloyd and Jeff Blockley, scarcely in his league, would surely have received greater international recognition had injury not hampered him in mid-career. His first appearance was in a European Championship qualifier in February 1971 in Malta (a 1-0 win on a dust-bowl of a pitch). He looked set for a long England career. Todd got his first call in May 1972 against Northern Ireland, playing in the right back berth. When Bobby Moore’s career came to an end as England failed to qualify for the 1974 World Cup, Todd started to fill the number six shirt. On May 11, 1974 in Portugal, McFarland and Todd lined-up alongside each other at the heart of the England defence for the first time. They would only play in the same England team together another three times, largely due to McFarland’s 1974 injury that kept him out of the game for around a year. Both players were unfortunate in that they never played in a major tournament for England. Like a number of excellent players, they came along in the post-1970 period during which England disappointed in the 1972 and 1976 European Championships and 1974 and 1978 World Cups. By the time England had recovered from their 1970s slump, both Todd and McFarland were approaching the end of their careers. But they were both outstanding defenders and while Clough and Taylor carved a niche out of transforming “ugly-duckling” players into medal-collecting swans, such as Kenny Burns, John Robertson and Peter Withe, he didn’t have to do that with both McFarland and Todd because they were such classy performers. They were certainly better than some more recent defenders who have dominated the England team – if Rio Ferdinand and John Terry can rack up 159 caps between them, how many would McFarland and Todd get if they were playing today? Next Entry Calling in on….Dartford, fanfare for the wooden man!